Homeopathic cimicifuga is made from the herb black cohosh (Actaea racemosa). 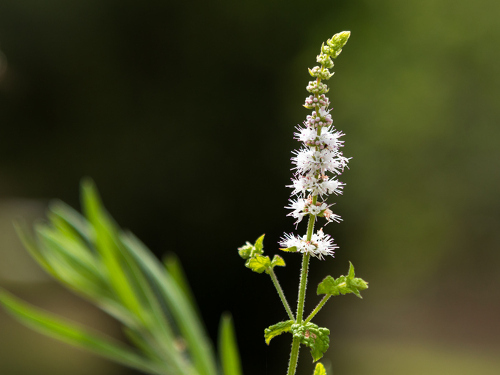 The Native Americans used black cohosh to treat malaria, kidney problems, sore throats, and women’s health problems, including menopause and more. The homeopathic black cohosh is primarily considered a women’s remedy, and is most often prescribed for gynecological issues as it works on uterine muscles. That being said, cimicifuga could also benefit the nervous system and people with head, neck, and back pain, as well as those with emotional symptoms. Read on to learn more about homeopathic cimicifuga, including its history, and various uses and health benefits. The former genus name of black cohosh, Cimicifuga, has its origin in the Latin words cimex, which means “bug,” and fugere, which means “to flee.” This also means “bedbug repeller.” Other names for black cohosh include rattleroot, black snakeroot, squawroot, and cohosh bugbane. It is also part of the Runanunculaceae family, and it is native to eastern North America. The herb prefers moist and shady conditions, and is found in hedgerows and woods. In 1844, black cohosh gained popularity when eclectic physician John King used it to treat nervous disorders and rheumatism. Other mid-19th century physicians later used black cohosh for several women’s health problems, such as endometritis, and various menstrual problems. In 1852, a team of American homeopaths, Dr. Paine, Dr. Wells, Dr. Hempel, and Dr. Mears, established the effectiveness of homeopathic cimicifuga. Homeopathic cimicifuga is made from the fresh root and rhizome of black cohosh harvested in the fall. It is then pounded to a pulp, mixed with alcohol, and left to stand before being strained, filtered, and succussed. Black cohosh is a major herbal remedy for women’s health issues, and the homeopathic cimicifuga is helpful for menstrual and menopausal symptoms. It also addresses related emotional symptoms like depression. Let’s take a look at how cimicifuga manages to treat problems related with menstruation, menopause, and pregnancy. Cimicifuga is used for heavy menstrual flow (menorrhagia), painful menstruation (dysmenorrhea), and premenstrual syndrome (PMS). There will also be dark-red, clotted blood, along with shooting and cramping pains that radiate across the pelvis into the thighs. The pain will then travel to the lower back. Menstruation will either be too frequent, too early, or absent altogether. Before menstruation, there may also be head congestion and burning breast pain. Sitting and stress will worsen symptoms, whereas gentle movement improves symptoms. Homeopathic cimicifuga is a common menopause remedy. It is used for severe hot flashes, weakness, insomnia, fainting spells, breast and ovary pain, and other typical menopausal symptoms. That being said, symptoms are quite severe. Other common symptoms include depression, irrational fears, insomnia, neck or low back pain, and rheumatic and arthritic pain. Warmth will improve symptoms; however, the greater the blood flow, the worse the person feels. Cimicifuga is used during pregnancy when nausea, vomiting, and lack of sleep are also present. There will also be lower back pain and a bruised feeling throughout the body, along with abdominal pains shooting from side to side. The homeopathic remedy may also be prescribed for recovery from an early miscarriage and protracted labor. The women will also double over in pain, to a point where they feel they are going insane. In homeopathy, the remedy profile is significant to determine whether homeopathic cimicifuga is right for your mental, emotional, and physical symptoms. The homeopathic remedy is best suited for people whose emotions tend to swing between depression and overexcitement. The person will tend to have very intense emotional lives, possibly associated with fears of insanity and death. The emotional symptoms will often alternate with the physical symptoms, which include chilliness and sharp pains, especially on the left side of the body. Besides its positive effect on women’s health, the health benefits of cimicifuga also include its potential ability to treat depression, neuralgia, fibromyalgia, and head and neck pain. The following is further detail about how homeopathic black cohosh is beneficial for the body. Cimicifuga is used for headaches at the top or side of the head, which may be dull. There may also be pain or stiffness in the neck or nape of the neck, which may radiate to the shoulders, left arm, or upper back. The upper spine is also sensitive to the touch. Symptoms worsen from wind, cold, drafts, dampness, and weather changes. At the same time, symptoms improve from wrapping up, lying flat, or putting pressure on the head and neck. Neuralgia is a severe pain due to nerve damage or irritation. Cimicifuga is used for radiating or electric-shock pains along with aching and neuralgia related to the uterus, face, eyes, ribs, heart, and sciatic nerve. The person is also often depressed, talkative, anxious, and restless. The homeopathic cimicifuga is useful for depression that is associated with black moods and heavy sighing that alternates with euphoria, talking too much, and a tendency to jump to topic to topic. The fear of death and insanity will worsen with menopause. Cimicifuga is sometimes given for postpartum depression, especially when the woman has feelings of imprisonment. Fibromyalgia is the chronic, widespread muscular pain with no clear cause. Cimicifuga is used for fibromyalgia when there are muscle spasms, stiffness, twitching, and jerking of the limbs. The person also has an extremely tender spine. Touch or motion worsens symptoms, and warmth and pressure improves symptoms. Where do you find homeopathic black cohosh? Cimicifuga can be purchased online or at your local health food store. It can be found in pellet or liquid form. You can also get cimicifuga right from your homeopath when they have recommended the remedy based on your physical, mental, and emotional symptoms. Your homeopath will likely have cimicifuga on hand to help treat the concerns you came to see them with. As mentioned, homeopathic black cohosh is used for neuralgia, head and neck pain, depression, fibromyalgia, and problems related to menstruation, pregnancy, and menopause. It is a good idea to work with a qualified homeopath. They will be able to recommend the best dosage and potency of cimicifuga. At follow-up appointments, your homeopath will also tell you whether you should change your potency, dose, or remedy. Hershoff, A., N.D., Homeopathic Remedies: A Quick and Easy Guide to Common Disorders and Their Homeopathic Treatments (New York: Penguin Putnam Inc., 1999), 149, 165, 219, 225, 233, 235. Lockie, A., Encyclopedia of Homeopathy: The Definitive Home Reference Guide to Homeopathic Remedies and Treatments for Common Ailments (New York: DK Publishing, Inc., 2000), 48, 212, 218, 256, 258. “Cimicifuga Rosemosa,” Home Remedy Central; http://www.homeremedycentral.com/en/homeopathic-remedies/homeopathy/cimic.html, last accessed Aug. 16, 2017. “Cimicifuga,” herbs2000.com; http://www.herbs2000.com/homeopathy/cimicifuga.htm, last accessed Aug. 16, 2017. “Black Cohosh,” Home Remedy Central; http://www.homeremedycentral.com/en/herbal-remedies/herb/black-cohosh.html, last accessed Aug. 16, 2017.